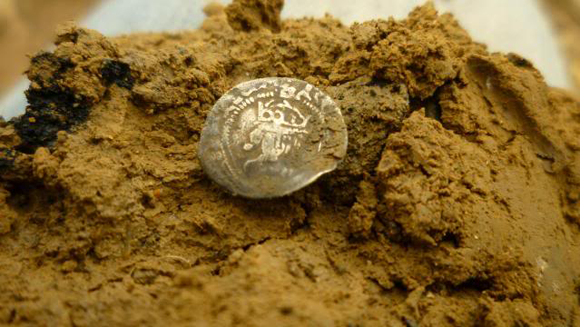 The Joan Allen blog would like to introduce Neil Jones, who will be talking about his latest finds and exploits from the world of metal detecting. In his first post, Neil talks about using the Minelab CTX3030 detector and seeing if it lives up to its hype. Two months before the release of the new Minelab CTX3030 I was asked by Gordon Heritage (“Iron Hearted Gog” on the forums) if I would like to have a go with it. It didn’t take much persuading even though I had to travel down to Buckinghamshire for around four hours detecting time due to Gordon’s work schedule. I arrived at Gordon’s and had one of his famous filtered coffees which livened me up a little too much, as I’m hyper anyway and that isn’t good for Gordon as he’s sort of laid back. We set off for the site which was only fifteen minutes of Gogg time away (35 mins). 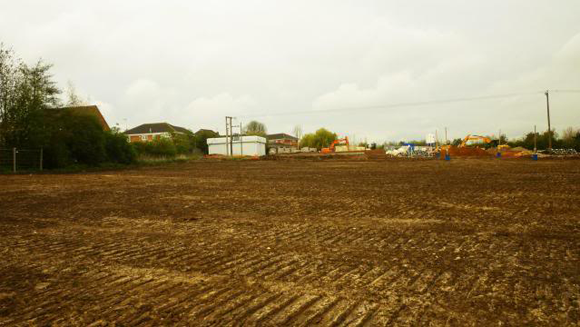 The site was a muddy building site which had been heavily detected for around a month so this would be a good test for the machine. As soon as we got out of our cars to get set up it started spitting which made Gordon speak a colourful language as we walked to the site. I was to use the CTX 3030 and Gordon was to use my E Trac. He started me off on a basic setting which he soon changed for me to his tadpole program as that was more to my style of searching. I set off swinging steady and carefully, I could hear the iron as the site is very mineralised and straight away a low tone which sounded like it was a surface signal ended up being a piece of lead at around 6”, which surprised me somewhat. The next signal was a similar tone but this time was a hammered half penny at approx 5” and again sounded like a near surface signal. It was lovely seeing the the thin edge of the small grey disc just peeping out of the small clay clod – that’s one of my fave parts of detecting, the slow opening of the parcel while taking clodcam pics I just love it. I gave Gordon the hammered sign and got the thumbs up then carried on. After a few bits of lead I got a medium tone signal, it was surrounded by iron but was surprisingly clear. I dug out a roman coin of Constantine in quite good condition. The CTX was so easy to use and understand, searching for finds seemed like taking candy from a baby it was that easy. The coins just gave themselves up willy nilly, lots sounded like the were just under the surface but were 6 and more inches down. I got twelve Roman bronzes from that tight area then moved down to a water flooded part of the sight and got a smooth medium tone. I dug a large lump of shiny wet sticky yellow clay from about 2ft in to the puddle and started trimming the lump carefully with my spade till I revealed a tell tale round disc which was a Henry VII sovereign penny. 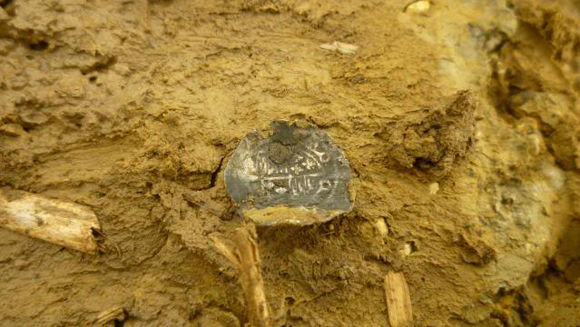 Wow I thought two hammered from the site and its been visited loads by other detectorists. Another Hammy sign to the Gogmeister and I carried on, I decided to detect a big area behind a long mount of soil. There was more trash here than the other part but I carried on, a smooth high pitch signal stopped me in my tracks. Gordon had the CTX set so the highest signals were larger finds and the iron was a few octaves lower. 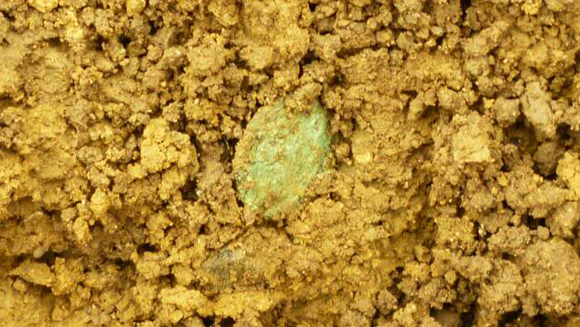 At around a foot I could see a green round disc, the coin was Roman and cruddy but a welcome find at depth and it wasn’t even faint! I found a few medieval buckles and mounts but the heavens opened and it poured it down making the site too sticky to work. I saw Gordon stood under a tree so went to join him, on the way I heard another high pitched signal and retrieved a worn Lizzy sixpence. “That will do me”, I thought to myself, me and Gordon then stood under the tree for twenty minutes discussing the machine and our thoughts on it. We drove back to Gordon’s house and he showed me all the set up on the computer, real hi-tec, I devised my own program and think its the mutts nutts. My opinion on the CTX 3030 is that it’s the most versatile general purpose detector on the market, very easy to use even on switch on and very very well balanced so easy to swing for long periods. I have now purchased one as the urge was killing me. I will give more in depth info in the very near future using the CTX on different sites including the beach. Happy Hunting folks! Neil’s next post will be available on the Joan Allen blog next week. 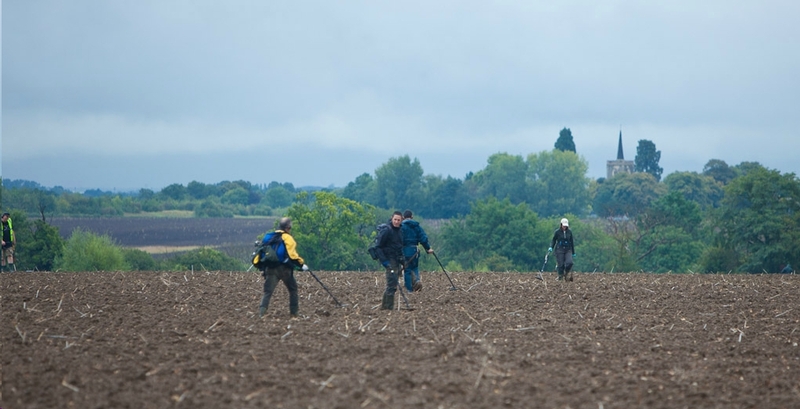 Let us know if you have been out detecting recently and share your finds on the Joan Allen Facebook page. What child would pass up a treasure hunt in the middle of nowhere with a mini metal detector in hand to match your ‘grown-up’ model? It’s really easy to turn your hobby into a fun pursuit for all of the family – you justhave to get a little bit creative with it. 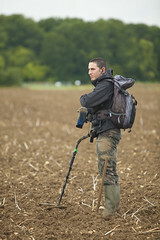 Joan Allen show you how with our 5 handy ideas to make metal detecting fun for all. Unearth the competitive streak in your child by turning a few hours of metal detecting into an action-packed competition or race. Take them to a large field with their siblings or friends and let them roam for a few hours. The first person to find a few pieces of something could bag themselves a treat on the way home or better still, introduce a time-trial and see who can beat the stopwatch. Practise your best story-telling techniques and create a grand fantasy tale around a deserted piece of land or a nearby beach. Exaggerate gruesomecharacters and vicious battles that happened hundreds of years ago and human remains that could still be found at this very spot. Let your child be a pirate, eye patch and all and see how fast they’ll be skulking around for treasure. Take the birthday celebrations outside for what could potentially be a very cheap and cheerful day out for all the children and their parents. If you have the budget you could perhaps hire a few detectors for the day and let them pursue the gold in pairs or alternatively, there’s nothing wrong with an old-fashioned bucket and spade. Just make sure the young detectorists aren’t digging up mole-sized holes in your local park. How heart warming is it to see two or three generations at the edge of a lake with a flask of hot tea and a fishing rod? Translate this into your dream picture and make metal detecting a regular bonding day with the family. It could be once a week or once a month but children will value that quality time and look forward to it when it comes. What you and the family find on an expedition could wind up on display in a glass cabinet so show your child what other impressive finds are in the museum. Drop in an impromptu history lesson while you drift in-between exhibitions and tell your child how amazing metal detecting can be. Trust us, it will work. Joan Allen would love to hear about your family experiences so please do post them on our Facebook page with pictures of your finds. To view our full range of children’s metal detectors visit our website here and be sure to check out the laws on metal detecting in the UK before you set off. 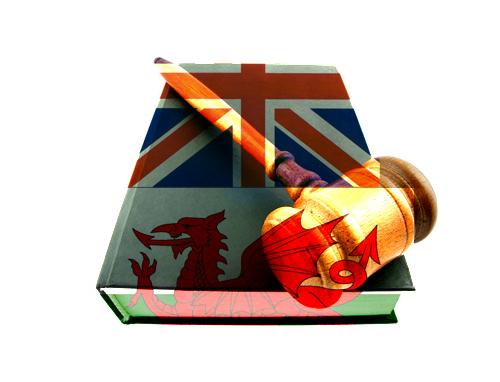 Following my previous a rticle on “etiquette in metal detecting” I thought I would touch on the law surrounding metal detecting and how it affects the metal detecting fraternity in the UK. Please be aware that the legislation is different if you live in Scotland and Northern Ireland.